tsk, tsk, tsk – Hello Korea ! So I asked my adult Korean teacher student what Holt said in the documentary, and he said Mrs. Seol blamed their poor record of helping adoptees on the Korean government, that they needed financial help and the Korean government didn’t give it to them. 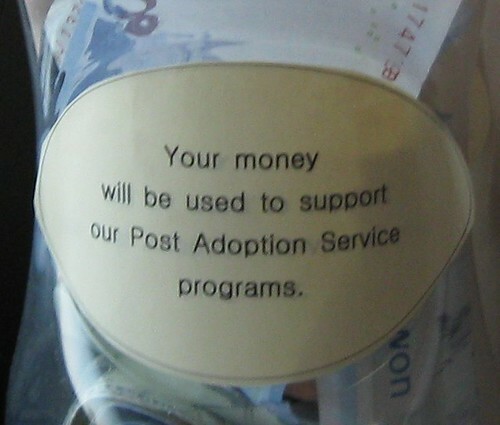 Not true, said my student, they give some money towards Post Adoption Services, just not a lot. Well, I don’t think the government should give Holt ANY money, as it won’t be accounted for. It only takes a couple seconds to photocopy their skinny records. It does, however, take half a day to defend your lame excuses for NOT being helpful to t.v. stations once you’ve made a big mess and are trying to get out of it. I don’t have the raw footage, but I know it exists and so I can paraphrase what transpired in my meeting with Holt Korea and know that none of it is slander or libel. It’s recorded on film, these are my impressions of what was said, and the footage on file will corroborate it. At the beginning of our meeting, prior to my even asking these questions, Mrs. Seol began by saying all these problems were not Holt Korea’s fault because I had never spoken with Holt Korea directly. I told her Holt International told me they would talk with Holt Korea, and that it was they who offered to be my liason. When asked why Holt Korea said there was “nothing important” as an excuse not to send me my documents, Mrs. Seol defended Holt for keeping records when nobody else bothered. (I will concede this point) She also said that nobody ever imagined adoptees would return wanting to find out about themselves, so nobody bothered to take a lot of information. (again, this may be true, but that does not exonerate them from not providing the information they have to the adoptees upon request) I countered that what little information was there was MINE and ABOUT ME and shouldn’t be controlled by some company. When asked why there weren’t copies of these documents with my Holt International child records, Mrs. Seol said that documents include contracts between relinquishing parents and therefore they are confidential. I told her of course, and they still would be at Holt International, but it is a false claim if Holt International says they have all of our documents or that Holt Korea has, “nothing important.” There is no good reason a copy can not exist at Holt International, especially since they also have total control over what we adoptees can and can’t see. When asked why confidentiality about relinquishing parents made any difference in the case of an abandoned child, there was no answer. When asked why they couldn’t photocopy the contractural documents and white out any identifying information, there was no answer. When asked for more information about girl #4709, they said they could not do that because there was no way she could be my sister because of our age difference. I pointed out that they had my age wrong, that our names were made up, and that it was highly unusual for two girls to be on one document from the same place on the same day. Mrs. Seol claimed this was not unusual and flipped through the book for that year and showed us a couple documents that had lists of many orphans on them, with no specific information. However, these documents were clearly designed to list multiple children. Mine was very specific and asked specific information and was designed for one person. I challenged her to show me another document of the same format as mine from Wonju that listed multiple children. We flipped through the entire book, isolating each of the documents from Wonju that were of the same format, and NOT ONE of them had two children on the same document. When asked why their policy was different from Holt International’s, Mrs. Seol told me it “wasn’t my place” to ask about their operations. Mrs. Seol is younger than I am, so Confuscian respect standards have nothing to do with this, and asking about their operations is very much my place, since I am a pawn of their operations. When asked why I never got a translation of my documents as requested, Mrs. Seol produced a translation sent to Holt International, which I had never received. She said it should be up to me to get a translation where I lived, and that I didn’t ask for it when I asked for my documents. “Can you imagine how it feels?” I asked her, going through this process? I told her that I lived in America, that I didn’t even KNOW there were multiple Holts at the time, that Holt International said they would contact Holt Korea, which is appropriate since I DON’T KNOW HOW TO SPEAK KOREAN, and that of course I needed a translation of any document from Korea, since I DON’T KNOW HOW TO READ KOREAN EITHER. Why does this have to be so hard? Mrs. Seol was silent after this. Which was a pleasant change, because she didn’t allow me to get a word in edge-wise, and even though I repeatedly asked her to give me equal time or to break up her talking so I could get a proper translation, she barreled on. So for every five minutes of her talking, I would get a two sentence synopsis, and it was nearly impossible to get my questions inserted. Nearly every question I asked was met with a nasty attitude and on several occasions, eye rolls. She repeatedly said she didn’t have time for all this, and that if I didn’t have any questions about personal history, then she would have to leave. And I hear she even said she didn’t have time for abuse from an adoptee. In my later conversation with Steve Kalb, when I asked him why Holt couldn’t get me a list of orphanages near Wonju, he said that Holt doesn’t have a comprehensive list of orphanages. I didn’t ask for a comprehensive list. I only asked for help with the names of orphanages near where I was abandoned, so I could begin a search in person. I told him that by searching on the internet I had found a couple myself, but why is it that Holt Korea says it’s “not possible”? I asked him, “Doesn’t Holt know where it gets its human bodies from? How is it Holt doesn’t know which orphanges they work with? Or isn’t Holt in the orphan business?” Silence on the other end. Copying this to the holtsurvivor blog. My theory is they just said that so they don’t have to bother, and to dissuade some of us from finding the truth. For every ten people they manage to discourage at the first triage pass, only one of us has the tenacity to keep persisting. And of those that do, these roadblocks discourage most of those remaining. The records for us older adoptees were often botched. It doesn’t look good for Holt, and they don’t want to deal with us searching for clues about our beginnings, even though that should be everyone’s right, to know the beginning of their stories and eliminate the fiction from fact. I think it’s sheer laziness on their part: they say they don’t have the people and resources to deal with searching adoptees. Well, they should have thought about that in the first place. And their campaign to increase international adoption was hugely successful, so it’s only going to get worse for them. Clearly, they need to re-prioritize their distribution of adoption fees alongside preserving our identities and giving us access to these fundamental things all human beings on the planet deserve to know. It’s the only decent thing to do. But Holt does not understand basic human decency. They only recognize what they build and not what they destroy. Apparently Jeong dealt with this type of asshatter in her memoir while trying to get information as well. While I was reading it, my jaw just dropped. What are they so afraid of?! Holt had various sources of children, orphanages that belonged to them as well as those that didn’t belong to them. And of course other sources, children from the streets and thos brought directly to them. St-Paul’orphanage picked out “adoptable” children (and me) from children’s shelter to hand them over to Holt. Holt got “adoptable” children (and me) from St-Paul’s orphanage. Holt also picked out “adoptable” children directly from the same shelter. None of the two kept record of my ID informations that I gave them myself. They both knew where I was before being at St-Paul, but both of them refused to tell me the name of my first orphange that I had forgotten by the time I arrived. My mistake is that I told them I also give my ID informations to my first orphanage, so they were aware that my first orphanage kept record of my ID. They are afraid of the truth being revealed, becaue revealing the truth would expose their lies and their corrupt practice. The conflict of interest here needs to be exposed. And the dumbfoundingly stupid thing about Holt is THEY ARE THE ONES outing themselves. Every time they frustrate what is clearly any person’s basic civil rights with their flawed logic and policy, they expose themselves. Even if they act within current law, they are clearly acting outside of the higher laws of the God they say they believe in. The Harry Holts of this world can no longer ride roughshod over the welfare of adoptees, like Christian cowboys in a land where they make all the rules. It’s a new day and age, and if Holt wants to violate me, I’m going to make sure the whole world is watching. I am proud to relay this experience to other adoptees and adoptive parents, and I hope my frustration can at the very least give everyone a better sense of who the Holt adoption agencies really are and what they do. I applaud you for doing so. With the photo, I understand better. I thought you were both in a same folder, or even on a same paper but written separately, one after other. I never thought you were on a same form like this, with your numbers written together, with your names written on a same line. Nobody, not even the most grateful-happiest-KAD, would accept to leave that without investigating. Oh! I didn’t realize this wasn’t obvious to everyone. I will add it to other posts referring to the document as time permits. Another mystery about this document is also that our two names are written in a different hand, (they had a handwriting analyst confirm this) while some of the information referring to both of us is in the same hand. They dramatized what could have happened on the documentary. But even if it was two separate hands, why? Maybe we were temporarily cared for by two separate people, since I was clearly at least a year younger than her? They only list the one officer as well. What are the odds two separate children are abandoned on the same day in the same small area and found by the same person? Not likely. Maybe a statistician could run the numbers on that! And actually, it looks to me like someone CHANGED my age from 2 to 3. (notice it is bigger and darker, as if traced over as they were changing the 2 to a 3) Why? And why did HOLT later make my birthday 6 months 6 days before Kim Sook Ja’s, when CLEARLY I am a year younger than her and not a 6 months 6 days older than her? Wonjooo social document No. 1486-209 March, 11, 1966. To Holt Children’s Services, Inc. Please check the below abandonee referred from Wonjoo city hall. 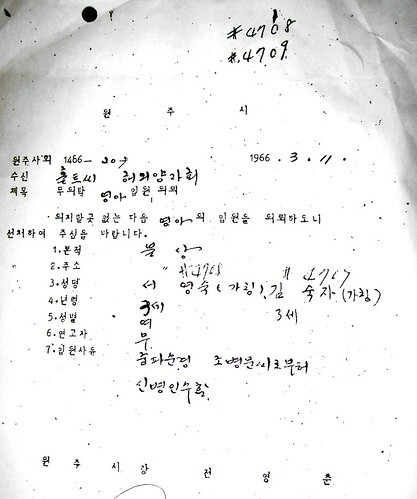 But it was still a unique situation, and Holt Korea looked like the story fabricating institution they are by writing this document off as being typical, when the camera recorded us going through the book that had somewhere between 70 and 100? of these same forms, and NOT ONE had two children noted on the same form. I am more and more convinced this was because Holt had learned by this time that finding adoptive parents for sibling groups was harder, and that where possible, as is the case with two girls too young to verbalize their relationship, it was more beneficial to “the cause” to distance their relationship at every possible opportunity. This whole document business making us adoptable is sick. For example, on my Hojuk (family registry) the one they make up where they list us as head of our families and us being the only ones listed, it says I am from Dai ku, which is from the address of the social worker appointed as my paper legal guardian. When they had documents on file that I was from Wonju. Expedient, yes. Convenient, yes. A lie? YES. Do you think this paper was sent to your aparents? The document Holt gave me during the Family Tour was exactly what my Aparents already had, so when I went to search my family, I didn’t even think of asking them to check my documents. Since few years, I wonder if there is a paper they didn’t give me. I found my family but I still have lot of questions in my mind since my father – the only person who could have answered if he lost me or abandoned me – is gone. I only know that Holt didn’t get the consent from my father before putting me up for adoption, so they definitely lied, but I can’t stop thinking of all kind of scenarios. No. This document was not in the records my parents had. They had the same documents that Holt International had in their file, and nothing more and nothing that Holt Korea had. Holt International HAS TO STOP telling adoptees that they have everything in their files, since I saw the books in Korea and Holt Korea says they only give those out if you ASK FOR THEM SPECIFICALLY from them directly. But most definitely, there is a log book entry on you and probably some kind of document from your transfer from St. Paul’s. Could be worth checking out. St-Paul kept no record of me. They kept photos of children, but no paper! Immediately after my arrival to Saint-Paul, I was put under the responsability of Holt. On the social history, it says “1/29/75 To Holt from St. Paul’s orphanage” (I arrived there in January), and “present location: St. Paul’s orphanage” (I stayed there until 2-3 weeks before departure). If I want to check out, what am I suppose to ask them? I’m not sure. I guess ask for EVERY document about you Holt Korea has, including log book entries and any transfer or intake documents.